The speeds and times are only a very rough guide which is adjusted by the marshalls to ensure everyone is safe and comfortable. All groups have 'regroups' to enable the slower runners to catch up and recover - rest time is typically longer for the slower groups. The recently introduced 4 mile group is proving to be very successful. 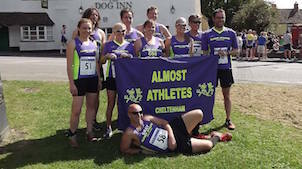 Ideal if you are building up your running gradually or returning after a break and would like to join an 'easy' and supportive group. The selection of groups running on a particular evening is critically dependent upon the number of marshall volunteers. This particularly applies to the slower groups as the majority of our existing marshalls prefer to run in one of faster groups. The only qualifications are knowing the route and being able to keep up the group you are marshalling. If you are willing to assist please send an e-mail to almostathletes@hotmail.com, or speak to Graham Fletcher on a Wednesday, preferably before 7pm! All runners must take personal responsibility for their own safety. Keep behind the lead marshal. If they are going too slowly for you please move up to a faster group next time or volunteer to lead a new group. Please keep a watchful eye on the runners at the back of your group and kindly ensure that no one is left behind. When running in the dark make yourself visible by wearing high viz/reflective clothing. Take care when crossing roads and driveways. If anyone decides to leave the group before the end of the run they MUST ensure at least one marshall is made aware of their decision. Be aware of the weather conditions - dress and hydrate accordingly. If you are not happy with any aspect of our club group runs, please email almostathletes@hotmail.com - we always welcome feedback.